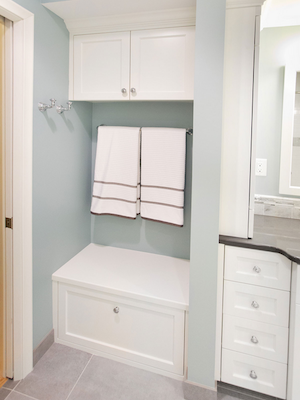 Artisan Cabinet Company completed the design and fabrication of these beautiful custom vanities and storage cabinets for this bathroom located in an Edina home. 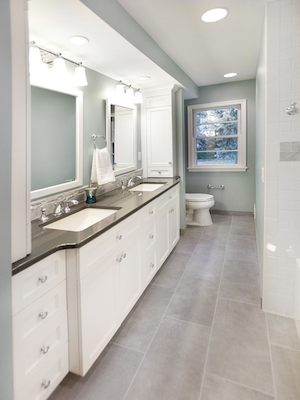 Custom cabinetry allowed the homeowners to get bathroom cabinets designed specifically for their everyday use and needs. We made the cabinets with Maple exterior and Melamine interior. We also made a five-piece drawer front to match the doors. The doors and drawers were also constructed of Maple. Lastly, we painted the cabinets on site after the install was complete. Painting or finishing cabinets on site after the completed install gives our clients a clean, finished look. We fill in all the nail holes and sand down those areas prior to finishing. Along with a unique and custom design, this is another advantage of custom cabinetry. If you are looking for new cabinets for your home, custom cabinets may be your best solution. Whether you are looking for cabinets for your kitchen, bathroom, mudroom, or any other room in the home, Artisan Cabinet Company is here for you. Please give us a call at 952-737-7088 to discuss your project.